Tag line: "He doesn't play golf... he destroys it"
Ever since he was a kid, all Happy Gilmore (Adam Sandler) ever wanted to do was play professional hockey. With the help of his father, he developed one hell of a slap shot, perhaps the most powerful the game has ever seen. But Happy isn’t much of a skater… or a puck handler. And he has a hard time keeping his temper in check. So, every year, when he tries out for the team, he goes home disappointed. Adding to his troubles is the fact that the IRS has just put a lien on the house owned by his beloved grandmother (Frances Bay), who failed to pay taxes over a 10-year period (including penalties, the amount she owes is $275,000). In short, Happy needs money… and fast! It’s at this point fate intervenes. Realizing he can convert his slap shot into a golf swing, Happy hangs out at a nearby course, hustling golfers by betting he can drive the ball farther than they can (and doing so each and every time, occasionally sending it flying over 400 yards). While taking his swings, Happy catches the eye of Chubbs Peterson (Carl Weathers), a former golf pro who was forced to give the sport up when an alligator bit off his hand. With Chubbs’ help, Happy wins a local tournament, earning him a spot on the pro tour. Realizing his short game (putting, chipping, etc) isn’t all it should be, Chubbs advises Happy to take six months off to sharpen his skills. But Happy needs money now, and with his towering drives, he captures the attention of the entire golf community, including Virginia (Julie Bowen), the pro tour’s attractive public relations director. Unfortunately, he’s also incurred the wrath of the sport’s top player, Shooter McGavin (Christopher McDonald), who’s none too happy to be playing second fiddle to an “amateur”. Can Happy win enough money to save his grandmother’s house, or will his short temper make him a laughing stock? As played by Sandler, Happy Gilmore is a very angry guy. Early on, we learn that his only claim to fame in the hockey world involved him removing his skate during a game, and then stabbing an opponent with it. We also get to witness a few of his tantrums first-hand (upon hearing that he didn’t make the hockey team, Happy tackles the coach). Even on the golf course, he loses his temper quickly, shouting obscenities at the ball when he swings and misses on the opening tee. His outbursts, during which he attacks fellow players, throws equipment, and at one point threatens Shooter McGavin with a broken beer bottle, would seem shocking in almost any other movie. 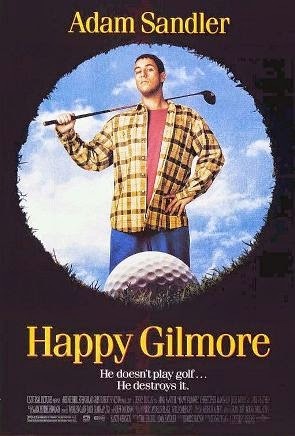 But Happy Gilmore stars Adam Sandler, an actor who has made a career out of playing likable louts. Sure, Happy sometimes crosses the line (in the film’s most hilarious scene, he and game show host Bob Barker, appearing as himself, get into a knock-down-drag-out fistfight on the golf course), but Sandler’s knack for bringing out the best in these sort of characters (due mostly to their basic, almost innocent approach to life’s problems) shines through in each and every scene. We root for Happy, and hope that he somehow gets the better of the arrogant Shooter McGavin (wonderfully portrayed by Christopher McDonald), all the while realizing he’s a guy who needs some serious anger management training. With its often funny, occasionally abrasive depiction of the world of professional golf, Happy Gilmore is an effective sports comedy as well as a showcase for its star, one of the few performers who can make audiences laugh at psychotic behavior.